"Discover what makes a hero" is the tagline for The Flash's new poster. 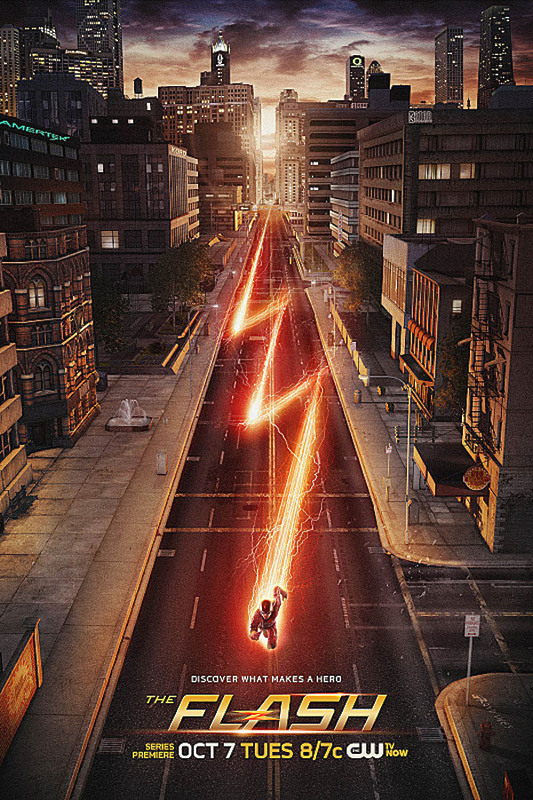 It offers us the sight of Barry Allen all Flashed up and zipping through the streets of Central City, leaving a trail of red lightning in his wake. If you look closely at the image, you can see that one of the buildings has the AmerTek logo on it. In the DC universe, that's a military industrial firm. Also among the branding that appears to be Easter Egg'ed into the image, there's the STAR Labs logo on the right, and further in the distance, the Queen Consolidated "Q" featured on a building. A nod to good old Oliver Queen, and Barry Allen's link to Starling City, no doubt. The Flash stars Grant Gustin as Barry Allen, a scientist who acquires superpowers after begin caught in a massive lightning stem brought on by a particle accelerator. The cast also includes Danielle Panabaker, Carlos Valdes, Jesse L. Martin, Candice Patton, Tom Cavanagh, Rick Cosnett and John Wesley Shipp. The Flash premieres Tuesday, October 7. While Jane the Virgin doesn't have a show like Arrow attached to it, to give it that extra boost as it makes its debut among all of the other new dramas arriving this fall. it is based on a telenovela, and as the very pink poster shows off, it's already generating some good buzz. The tagline works in a bit of wordplay with "She wasn't expecting this." Well, she's expecting something now! Jane the Virgin premieres Monday, October 13 and stars Gina Rodriguez, Justin Baldoni, Brett Dier, Andrea Navedo and Yael Grobglas. Check out the extended trailer for the series here.